We were invited to showcase our solution Smartcity 311 in a two-day event (23-24 February 2018) held at the Pandit Deen Dayal auditorium and organized by business world agency and powered by ICICI bank. 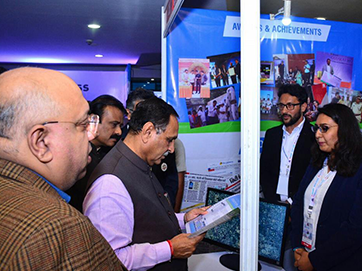 The summit was inaugurated by honorable Chief Minister Shri Vijay Rupani. We got a chance to showcase the insights of our project Smartcity311 to several VIPs and other event visitors throughout the event. Everything Civic received an overwhelming response due to the exclusive media coverage by national, international and news channels.